Stoke boss Mark Hughes challenged his side to "show their mettle" after a home loss to Bournemouth left them in the Premier League's bottom three. Two goals in 133 seconds stunned City as Andrew Surman's 16th-minute opener was quickly followed by Junior Stanislas' penalty, awarded after Ryan Shawcross tripped Benik Afobe in the box. Stoke dominated the second half and got a goal back when Mame Biram Diouf found the net from Eric Maxim Choupo-Moting's knock-down. The result, which follows their 7-2 defeat at leaders Manchester City last weekend, leaves them 18th in the table, a point above the Cherries. "We've got to get back on the horse," said Hughes. "We fell off last week and this week, and it's time to show our mettle. "Second half there were some decent performances within the team, without creating the moments. We've got to go again. There's no point feeling sorry for ourselves." Defeat at Stoke would have equalled Bournemouth's worst start to a league campaign after one win from their first eight games, during which they had scored only four goals. They were dealt a blow when forwards Joshua King and Jermain Defoe, scorers of two of those four goals in that time, were ruled out by illness and injury respectively. However, Benik Afobe, Jordon Ibe and Stanislas provided the necessary attacking prowess in the absence of the senior pair, especially during the opening quarter. Playing with a considerable wind behind them, the Cherries posed a threat on the break and they netted twice before Stoke had fully acclimatised to the blustery conditions. Surman's effort came at the end of an incisive move that involved a driving run down the right from Adam Smith and a neat lay-off from Stanislas. Minutes later, another break ended with Afobe being bundled to the ground by Shawcross - showing some rustiness in his first game since August - with Stanislas converting from the spot. 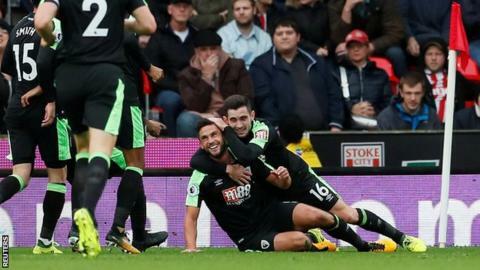 The Cherries were penned back for much of the second half and were wobbling when Stoke scored, but they dug in, demonstrating a resilience that will put them in good stead. The win is their first on the road in five attempts in the league and while it does not lift them out of the top flight's bottom three, it does close the gap with those directly above them, including Stoke. "It's a special win. It was a massive game, with Chelsea to come next week," said Bournemouth boss Eddie Howe. "We didn't want to become detached from the teams above us. Prior to Saturday, Stoke's lowly league position came with a caveat courtesy of a tough set of initial fixtures in which they faced Arsenal, both Manchester clubs and Chelsea inside their first eight games. In two of those defeats - against champions Chelsea last month and Manchester City a week ago - they conceded 11 confidence-sapping goals. While the result at Etihad Stadium was less reflective of the Potters' deficiencies than it was a showcase for the brilliance of Pep Guardiola's currently untouchable side, this highlights more worrying issues. It was too easy for Bournemouth to take control of the game, with the home defence at times too slow and lacking positional sense. Their promising attack came more to the fore after the break with Jese a greater threat down the left, his replacement Peter Crouch offering an aerial presence and Diouf showing his rediscovered instinct in front of goal for the third game running. But the opening 18 minutes left them with too much to do and boss Mark Hughes must now work out how he can arrest a run of form that has yielded one league win since 19 August and seen them slide into the danger zone. Hughes added: "Everybody says we start slowly in the Premier League, but until this week it was our third best start. "We've done OK up until this point but this week has damaged that view. We've got to make sure we get back on track at Watford at the weekend." Stoke have lost five of their last 10 home league games (W3 D2). Andrew Surman has netted two goals in his last five Premier League appearances, as many as in his previous 81. There were 133 seconds between Bournemouth's two goals. Mame Biram Diouf has bagged three goals in eight games this season, two more than his total of one from 27 top-flight games last season. Eric Maxim Choupo-Moting has been directly involved in four goals in his last four Premier League games at Stoke (two goals, two assists). Darren Fletcher made his 100th consecutive Premier League appearance - the longest current run in the competition. Stoke's fixtures do not get any easier. Next Saturday they are at high-flying Watford (15:00 BST), smarting from a narrow defeat at Chelsea this weekend. Bournemouth host Championship side Middlesbrough in the Carabao Cup on Tuesday (19:45) before hosting Chelsea in the Premier League (17:30) on Saturday. Match ends, Stoke City 1, Bournemouth 2. Second Half ends, Stoke City 1, Bournemouth 2. Foul by Joe Allen (Stoke City). Harry Arter (Bournemouth) wins a free kick in the defensive half. Delay in match Kurt Zouma (Stoke City) because of an injury. Attempt missed. Saido Berahino (Stoke City) right footed shot from the right side of the box is high and wide to the right. Assisted by Joe Allen. Attempt missed. Adam Smith (Bournemouth) right footed shot from the right side of the box misses to the left. Substitution, Bournemouth. Marc Pugh replaces Jordon Ibe. Hand ball by Benik Afobe (Bournemouth). Offside, Stoke City. Kurt Zouma tries a through ball, but Mame Biram Diouf is caught offside. Foul by Peter Crouch (Stoke City). Substitution, Stoke City. Saido Berahino replaces Jesé. Offside, Stoke City. Geoff Cameron tries a through ball, but Mame Biram Diouf is caught offside. Substitution, Bournemouth. Harry Arter replaces Lewis Cook. Corner, Stoke City. Conceded by Adam Smith. Foul by Junior Stanislas (Bournemouth). Eric Maxim Choupo-Moting (Stoke City) wins a free kick on the right wing. Jordon Ibe (Bournemouth) wins a free kick in the defensive half. Corner, Bournemouth. Conceded by Ryan Shawcross. Lewis Cook (Bournemouth) is shown the yellow card. Foul by Lewis Cook (Bournemouth). Joe Allen (Stoke City) wins a free kick on the right wing. Attempt missed. Jordon Ibe (Bournemouth) left footed shot from the left side of the box misses to the right. Assisted by Charlie Daniels. Offside, Stoke City. Eric Maxim Choupo-Moting tries a through ball, but Mame Biram Diouf is caught offside. Attempt blocked. Eric Maxim Choupo-Moting (Stoke City) right footed shot from outside the box is blocked. Assisted by Peter Crouch. Goal! Stoke City 1, Bournemouth 2. Mame Biram Diouf (Stoke City) left footed shot from very close range to the high centre of the goal. Assisted by Eric Maxim Choupo-Moting following a corner. Attempt missed. Geoff Cameron (Stoke City) right footed shot from the right side of the box misses to the left. Assisted by Jesé with a cross following a corner. Substitution, Bournemouth. Steve Cook replaces Lys Mousset. Corner, Stoke City. Conceded by Asmir Begovic. Corner, Stoke City. Conceded by Simon Francis.